C-GLCW in winter store at Geraldton - CYGQ, Ontario. C-GLCW in Recon Air care, at Geraldton - CYGQ, Ontario. • 55-3310 United States Army. Delivered 07-Nov-1956. Designated U-1A. Initially attached to the 3rd Aviation Company at Fort Riley, KS. Jul-1957 Moved with the unit when it deployed to Illesheim, Germany. Nov-1959. Assigned to the 708th Maintenance Battalion, Baumholder, Germany as a support aircraft, where it served until June 1964, then going into storage awaiting disposal. Feb-1966. Army Aeronautical Depot Maintenance Center (ARADMAC) Depot, Corpus Christi, TX. Jun-1967. Having been transported to Vietnam assigned to the 18th Aviation Company Pleiku. Jun-1966. 604th General Support Company, Pleiku, Vietnam for maintenance. Incident. Nr Plaiku, Vietnam, Jun-1966. Severely damaged in a post maintenance test flight. Full details in history below. Jul-1966. Returned to 18th Aviation Company after repairs completed. Nov-1968. Assigned to the 2nd Signal Group (Headquarters and Headquarters Company, 1st Signal Brigade) at Tan Son Nhut, Vietnam. Mar-1969. Passed to the 56th Transportation Company for overhaul in, re-joining the HHC, 1st Signal Brigade the following month. Apr-1969. Re-joined the Headquarters and Headquarters Company, 1st Signal Brigade the following month. Sep-1969. 142nd Transportation Company, Da Nang to be prepared to be shipped home. Dec-1969 Sharpe Army Depot, Stockton, CA, where it remained in storage for some time, before being put up for disposal. • C-GLCW Air Craftsmen Ltd., St. John, NB. Temp regn and Flight Permit 29-May-1974 who refurbished and civilianised the aircraft. 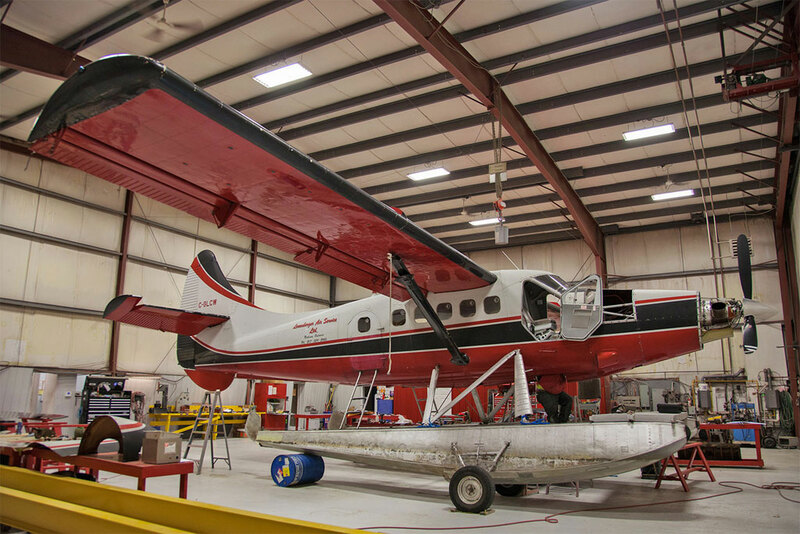 • C-GLCW Ontario Northern Airways Ltd., Jellicoe, ON. Regd 30th July 1974. • C-GLCW Leuenberger Air Service Ltd., Nakina, ON. Regd 11-Aug-1976. Operating on behalf of Leuenberger Fly-In Lodge & Wilderness outposts. Re regd 02-Feb-2007. Accident: Geraldton, ON. 02-Dec-1988. Lost power on take-off landing back on runway, suffering substantial damage. Repaired and returned to service. Accident: Nakina. ON. 08-Jun-1991. Shortly after take-off, the engine lost power and again on landing suffered serious damage. Repaired and returned to service. Power-plant: Converted to Vazar Turbine Power, by Recon Air, Geraldton, ON. “Some 140 miles north of Pleiku, CWO Ira Stein was involved in a test flight accident. Ira, here-after known as “Supersonic Stein”, and “The Flash”, in a burst of speed accelerated 53310 to 200 knots. At this speed certain vibrations were experienced which are foreign to Otter type aircraft. Upon landing, an inspection revealed that the over-speed had left all the wire antennas dragging on the ground, popped numerous rivets, severely wrinkled the wings and stabilizers and had completely torn off the elevator servo tab. As a result of the flight the aircraft will require extensive inspection and rebuild. The accident was not chargeable to the 18th in as much as the aircraft had been turned over to the 604th General Support Company and had not been released at the time of the test flight”. Tom Hull, who was the crew chief on “Reliable 310”, the Otter’s callsign, has provided some more information: “We took a small arms round through the elevator trimtab, located on the trailing edge of the left elevator. After replacing the trimtab, a functional check flight was required. Ira Stein flew the flight, with me in the right seat, in the Pleiku area. Prior to the flight, another aviator advised him to put the aircraft into a dive and exceed the VNE (velocity never exceed) speed by five to ten percent. If the aircraft had no vibration it was rigged right. This was not in the Army technical manual and approximately one third of the elevator was torn off and we landed back at Pleiku with no further incident. The aircraft was grounded and the overhaul facility from Thailand (44th Engineer Group) sent a team over to replace the elevator assembly and do a dye penetration check on the wing attachment bolts and fittings, to check for stress cracks. None were found. I think Mr Stein got a letter of reprimand. I got to remove and replace about a million screws without the benefit of an electric screwdriver”. 53310 re-joined the 18th Aviation Company after the repairs were completed. Tom Hull recalls one other incident with this Otter, on a rainy night on a return flight home from Saigon. “The magnetic chip detector light came on and the oil temperature went up ten degrees. The flight-following radar knew we were just south of Phan Thiet, about 40 miles south of Nha Trang but couldn’t determine if we were over water or land. It was raining so hard we had turned off the red rotating beacon because of vertigo and couldn’t see anything. The problem was there were mountains that came near the coast at an elevation of 6,500 feet. We put our parachutes on and swung way east and hoped for the best. It was the only time I ever considered jumping, but we managed to land safely”. The Otter continued to fly for the 18th Aviation Company until November 1968, when it was assigned to the 2nd Signal Group (HHC, 1st Signal Brigade) at Tan Son Nhut air base. It went to the 56th Transportation Company for overhaul in March 1969, re-joining the HHC 1st Signal Brigade the following month. It continued to serve until September 1969, when it went to the 142nd Transportation Company, Da Nang to be prepared for shipment home. It arrived at Sharpe Army Depot, Stockton, California in December 1969 where it remained in storage for some time before being put up for disposal. It was one of seven Otters for sale at the Depot in January 1974 by auction. The Otter was purchased by Air Craftsmen Ltd., of St.John, New Brunswick, a company heavily involved in the acquisition of ex military Otters. It was purchased in a “rough and ready” condition and made airworthy at the Depot for a ferry flight to St.John. A temporary Certificate of Registration as C-GLCW and Flight Permit was issued on 29 May 1974 to Air Craftsmen Ltd for the importation of the aircraft to Canada. Having been refurbished and civilianised at St.John, and officially registered C-GLCW it was sold to Ontario Northern Airways Ltd of Jellicoe, Ontario and painted into their scheme of white top, black cheatline, red under-fuselage. It was registered to its new owners on 30 July 1974. 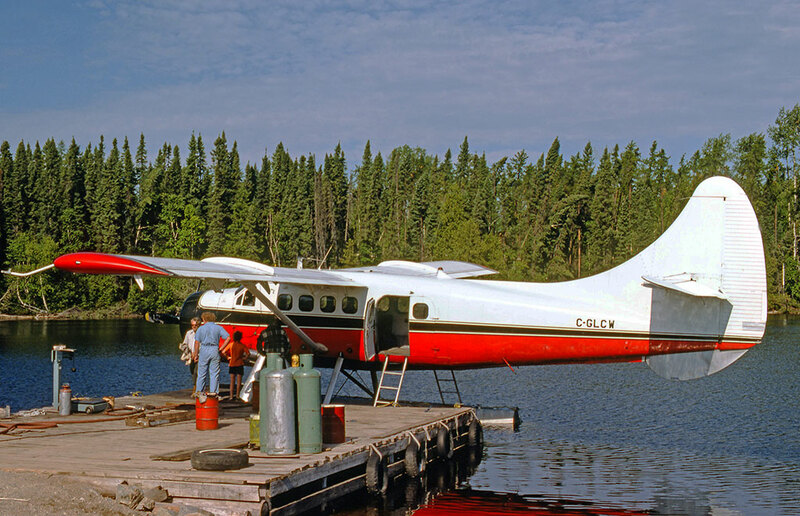 The company also operated Otter CF-CZO (71) at that stage on charter work in the Ontario bush country. 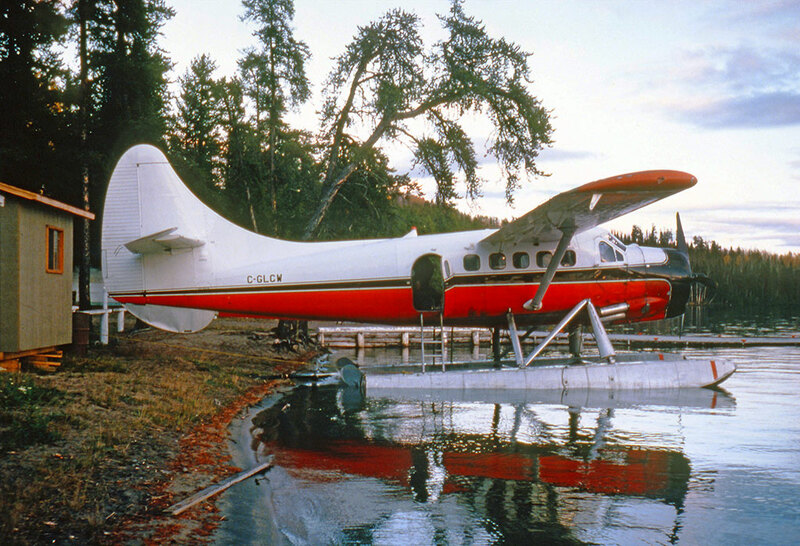 It continued to fly for Ontario Northern until sold to Leuenberger Air Service Ltd., of Nakina, Ontario in August 1976. This operator flies fishermen to remote outpost camps during the summer months, its Otters usually stored at Geraldton Airport, Ontario during the winter. C-GLCW met with an accident at Geraldton, where it had been stored for 33 days, on 2 December 1988. The pilot took off from runway 26 at Geraldton for a VFR flight to Nakina, the Otter’s base. At approximately 75 feet above the ground, the engine lost all power. The pilot made a forced landing onto the remaining runway and the Otter touched down with a high vertical speed, in a right wing low attitude and rolled to a stop. The right main landing gear attachment fitting and bulkhead were damaged. The engine had lost power due to water contamination in the fuel. It was repaired and returned to service. It met with a similar incident at Nakina on 8 June 1991. Shortly after take off, the engine lost power. The pilot turned the boost pump on and the engine re-started but the Otter landed heavily, resulting in damage to the float struts and fuselage fittings. The damage was repaired at Sault Ste. Marie. 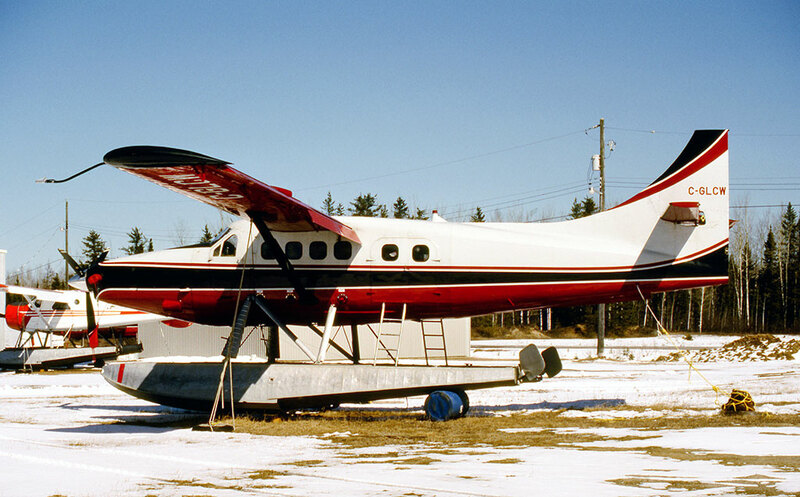 C-GLCW was converted to a Vazar turbine Otter by Springer Aerospace at Bar River, Ontario over the winter of 2003 / 2004 and was painted into a revised colour scheme, with a thicker black cheatline and darker shade of red. It continued to fly for Leuenberger Air Service alongside turbine Otters C-GLCS (428) and C-FSOX (437), during the summer months, flying on behalf of Leuenberger’s Fly-In Lodge and Wilderness Outposts – “As all our cottages are accessible by air only, one of our Turbo de Havilland aircraft will fly you and your party into the finest Walleye and Northern Pike fishing in unspoiled wilderness you can experience in Northern Ontario”. Otter LCW has continued to fly for Leuenberger Air Service for many years. It was mentioned in a CADORS incident for 29 November 2011. The Otter had just landed at Ogoki Post after a VFR flight from Nakina. It was disabled on the runway due to a flat tire. Ogoki Post is a First Nations settlement and this was well after the end of the summer fishing season, showing that the Otter was also used in winter. It again spent the winter of 2016 / 2017 at Geraldton, Ontario, in the care of Recon Air and was returned to service on 18 May 2017. LCW has now flown for Leuenberger Air Service for over 40 years.